Ultimate Fighting Championship (UFC) Welterweight young guns Sage Northcutt and Mickey Gall will collide this Saturday (Dec. 17, 2016) at UFC on FOX 22 inside Golden 1 Center in Sacramento, California. Northcutt is certainly a controversial star. The 20 year old may not be fighting the division’s best, but he has racked up three wins against just a single loss inside the Octagon. Alongside his credentials is his obvious athleticism, which has some fans believing in his championship potential. Meanwhile, Gall used smart words and some skill to line up perhaps the easiest first two fights of any UFC newcomer ever. This is a definite step up for the grappler, and now it’s time to redirect the frequently repeated promo question from C.M. Punk to his foe. Can he fight? Keys to Victory: Northcutt is a very explosive athlete. He’s got an exceptional karate background and the flashy kicks to prove it, but Northcutt tends to rely on his wrestling and athleticism more than anything else once actually inside the cage. He’ll have to be careful with that approach in this match up. Going to the ground with Gall is a terrible idea. Unproven in the cage as he may be, Gall’s jiu-jitsu ability is absolutely legit. If Northcutt shoots a far double leg and scrambles with Gall like he usually does, he’s going to wind up in a terrible position. Instead, Northcutt needs to really make use of his karate background. He’s got a ton of dangerous distance techniques, and it would be best if he actually stuck to them rather than rushing forward. Additionally, Northcutt needs to avoid backing straight up. He tends to fight in straight lines, and that could also be a problem against an opponent looking to land the takedown. Key Wins: From an objective MMA point of view, none. Career-wise, his submission of CM Punk at UFC 203 is very significant. Keys to Victory: Gall’s skill set is difficult to get a real grip on at the moment. The jiu-jitsu brown belt is definitely nasty on the mat, but the rest of his skills are unproven against real professional fighters. For what it’s worth, Gall has a background in wrestler and boxing, and neither have looked weak in his two matches so far. In this match, Gall has two definite advantages in size and grappling skill. Even if his wrestling and striking prove to be liabilities, those attributes alone can easily win a fight opposite a fellow green fighter in Northcutt. Gall should really take a page out of Pfister’s book, who rushed his opponent immediately and scored a takedown without much difficulty. Even when Northcutt managed to stand back up or scramble, his opponent’s aggression caused him to react and grapple, which is precisely what Gall wants. If Gall can drag this fight to the ground, he should be able to add a fourth straight submission win to his record. Bottom Line: It’s a fun match up of two prospects, even if they probably don’t deserve a co-main event slot. Northcutt is at a point in his young career where his primary goal should be experience and growth rather than climbing the ranks. There are still obvious holes in his game that more-proven fighters will take advantage of, but his current skills do keep him competitive with fighters in the bottom half of his division. Until he fixes up the weaker parts of his game, that’s where he should remain. 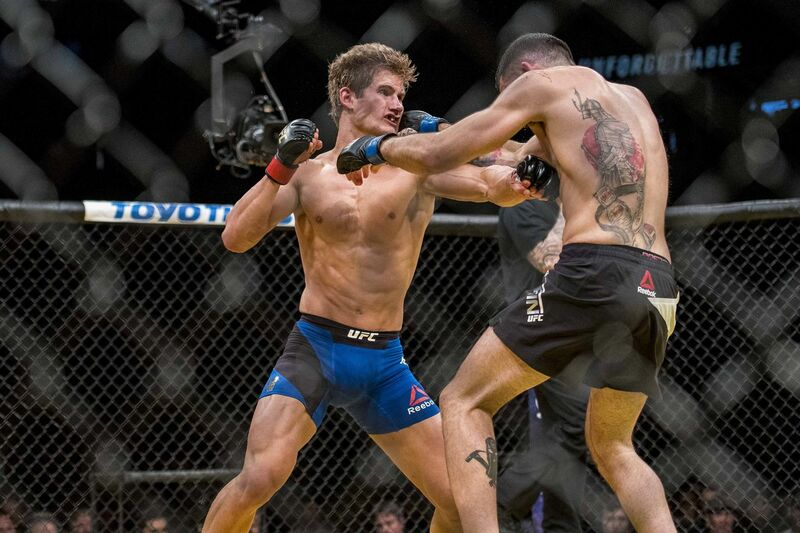 Northcutt does not need to a big step up with a win just yet, nor should he be released with a loss. Gall may have two UFC wins, but he still has to really prove himself. This is a perfect bout to do just that, as Northcutt is a solid test without being unbeatable. If Gall wins, he’s ready for more matches against fighters in the bottom half of the Welterweight division, and there are certainly plenty of potential opponents for him. On the other hand, he’ll receive a second chance with a loss, but it’s a bad sign that he isn’t ready for true UFC competition yet. At UFC on FOX 22, Sage Northcutt and Mickey Gall will duel in the co-main event. Which man will have his hand raised?